The studio is located outside the beautiful town of Charlevoix, Michigan, about one mile from Lake Michigan and Lake Charlevoix. As Bob and I were installing the additional four shafts and treadles to the Cranbrook, I started dreading the acrobatics needed to tie the treadles to the shafts. I had heard about weavers getting a system that allows them to tie everything up from the back of the loom. 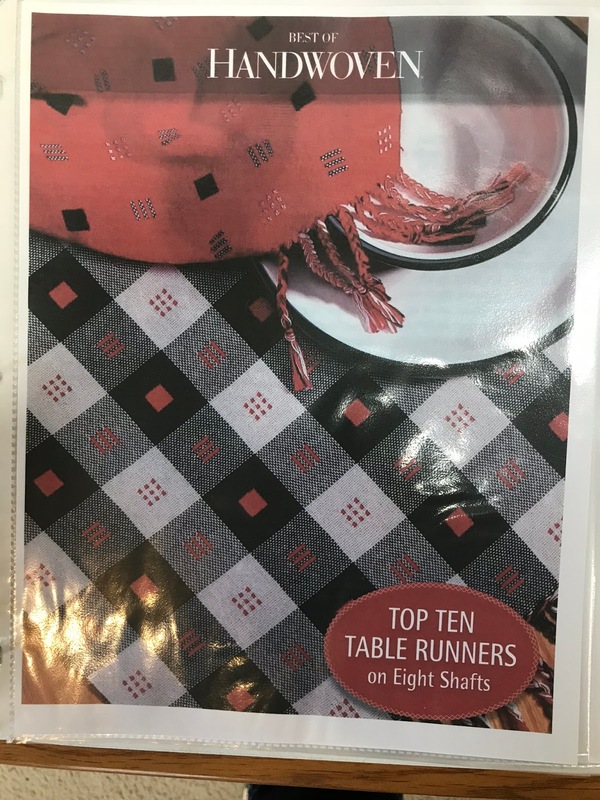 I did a little research and found the 20+ system by Woolhouse Looms. 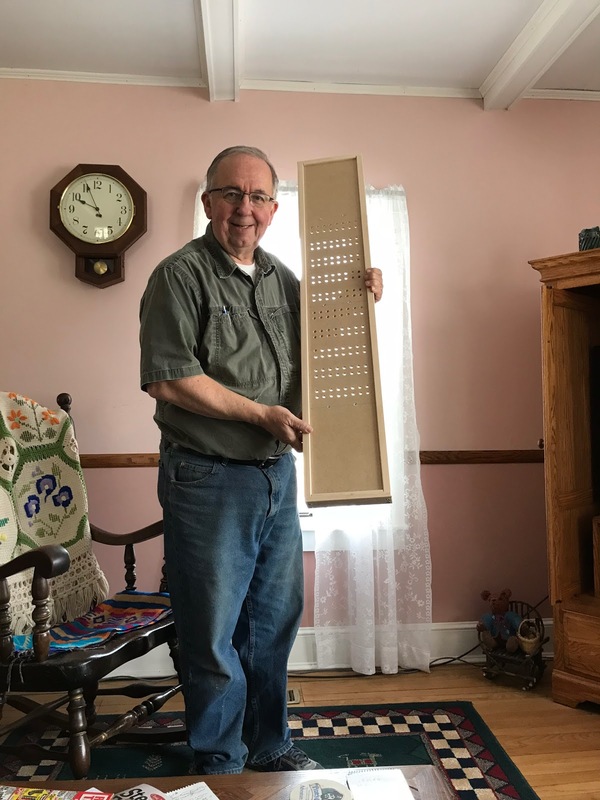 Bob is quite handy in the woodshop, as my regular readers know, so I asked him if he could make something similar. Here he is holding the completed tie-up pegboard. 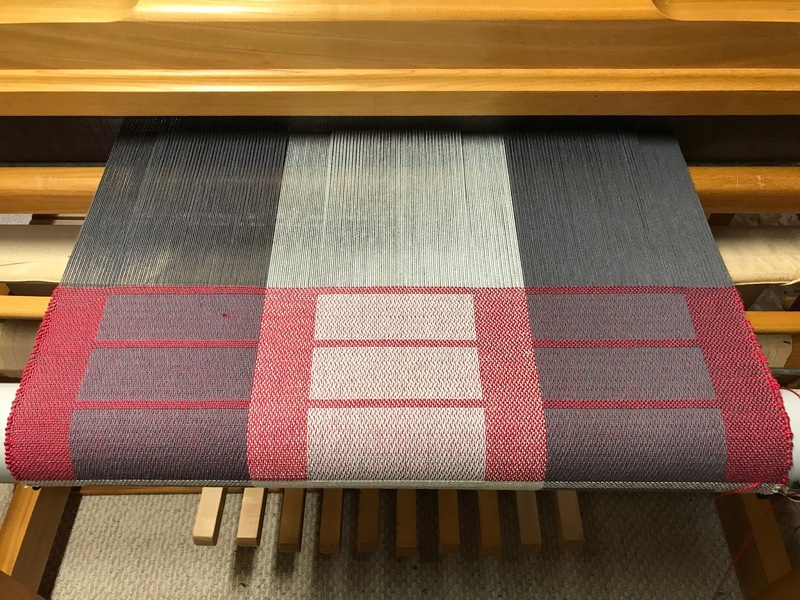 This is how it looks attached to the back of the loom. I can sit on the floor or a low stool to tie everything up. I think the height could be changed if I start having difficulty with it as low as it is, but for now I can manage. Flexibility with arthritis is an on and off thing. Some days are better than others. This system takes a lot of cording and can become very expensive if Texsolv is used. I did use some of it on mine because I had a tie-up kit I had bought very cheaply. I needed to splice my cording together though, because they were various short lengths. It isn't ideal, but is working. In the future, I'm planning on adding a system to my 10-shaft counterbalance loom when I get my long project finished. 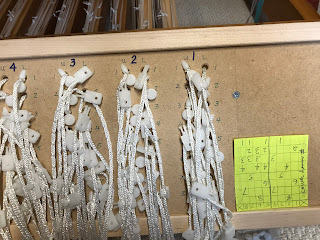 I will look for braided cording from the hardware store for that loom and splice a short length of Texsolv to the end that goes through the pegboard. 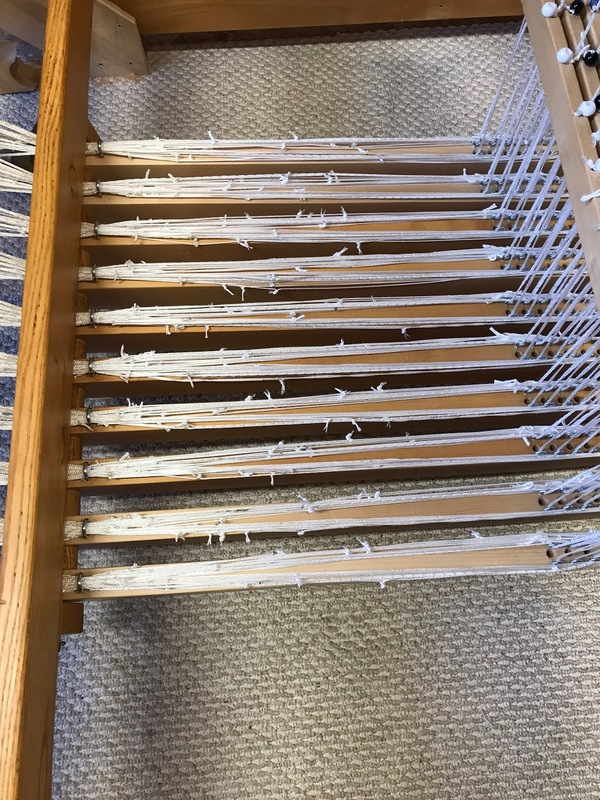 This photo is from the front of the loom, showing the routing of the cording at the back of the treadles. I labeled my pegboard with treadle #1 on the right. 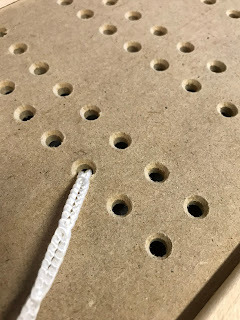 The shaft numbers are next to the holes. Each treadle has two columns of holes corresponding to each shaft. One column is for the upper lamms and the other for the lower lamms. Each hole gets a cord. Doing the math, that is 10 treadles times 8 shafts for both the upper lamms and the lower lamms for a total of 160 cords. That is a lot of yardage! 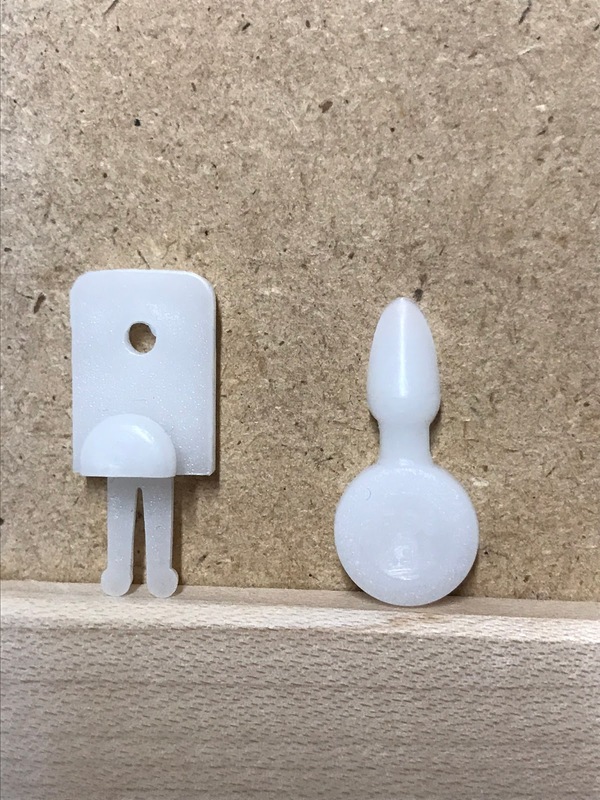 The kit I bought had a lot of two-leg pegs. I used them to mark the treadle resting on the floor position. If there isn't something on each cord, the inactive cords will slip out of the holes. 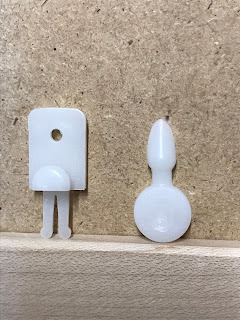 I already had that happen with these pegs, so the legs need to be poked into the hole. If I hadn't already had them, I would have used all arrow pegs. 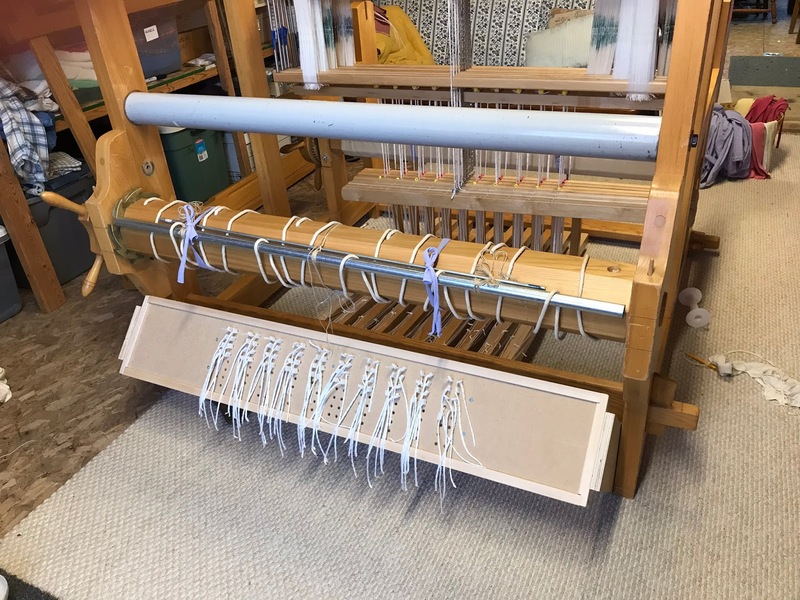 Before doing the tie-up, the loom needs to be in its locked position. 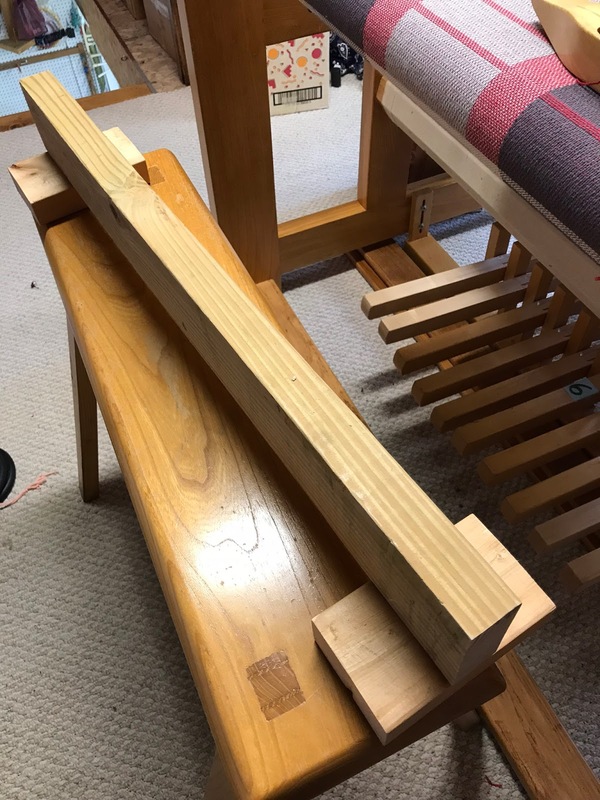 The treadles need to be raised to the weaving position so Bob made me this support bar to put under the them. We used the height the manufacturer specified, but it wasn't high enough. We need to add another block of 2"x4" wood to the bottoms. 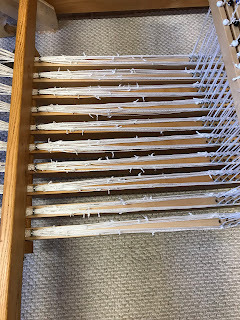 It helps to add some weight to the top of the treadles to keep them from rising when pulling the cording taunt. A board with a couple clamps would work also. 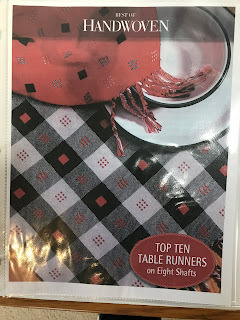 I chose a basic pattern from this book. 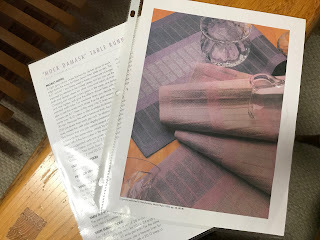 The pattern was originally published in the M/A 1993 issue of Handwoven, pg 43. 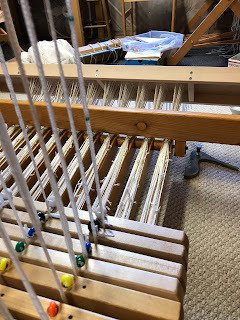 For the warp, I am using 8/2 cotton, 30 ends per inch in a 15 dent reed. 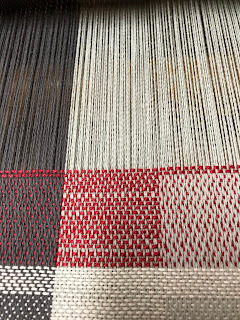 The weft is 3/2 mercerized cotton. If I was going to do this again, I would use a different reed with wider spacing. I have to be very watchful for doubled threads that are sticking together in the reed. It helps to beat on an open shed, change to the next treadle and then push the beater back. Here is my start. 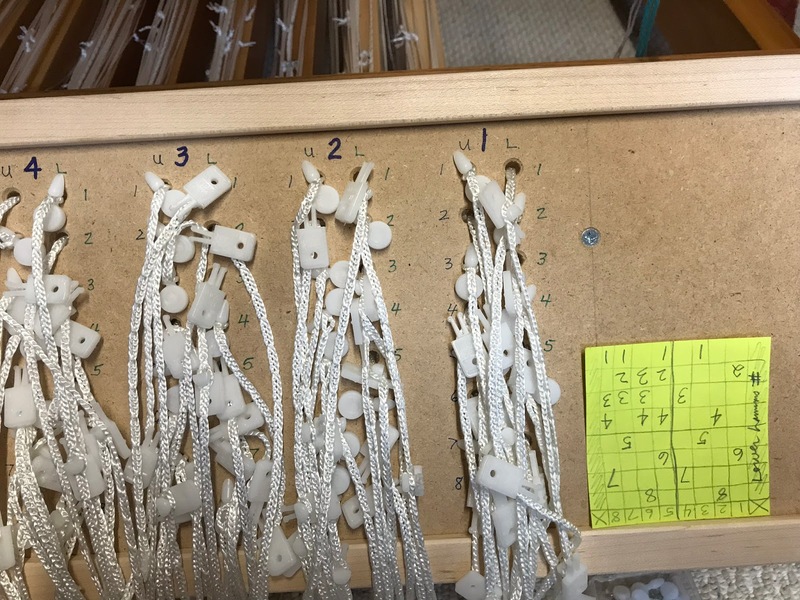 I was warned that the pegs may need adjusting once I start weaving, as the cords find their position. After about 8" of weaving, I am to that point because my shuttle is starting to slide under threads. It may have to stay like this until Tuesday, my next open studio day. Hopefully someone will come and be able to give me a hand evaluating each shed. Once the kinks are worked out, I think I am really going to like this loom with all our upgrades. Prime Trading Company offer a tailored solution to today's garment manufacturing.Our Production range Covers Tie and much more. Wow Jenny... This is great to see. I haven't been around much lately, but still going at it. I have the Woolhouse 'base' for my Toika Liisa 8/10, but I didn't buy the cords at the time. Didn't have the money. I did purchase 2 rolls of tex so far. (about 50 yds ea) But I'm thinking I'll need more. Can you estimate how many yards you needed to do this? Great idea on the treadle raiser too. I made a 'gate' for mine to space the treadles apart as my right foot can't feel them very well due to numbness. I love the first project. CM's are such quiet machines too. I have to get my potholders off the loom and on to something else. wow great you are a genius. I just re-read this post and your idea about using braided poly cord connected to the texsolv allowing you to use less tex. That is the answer! I have enough tex to do the job now. Thank you Jenny! Hope you are enjoying the Cranbrook! 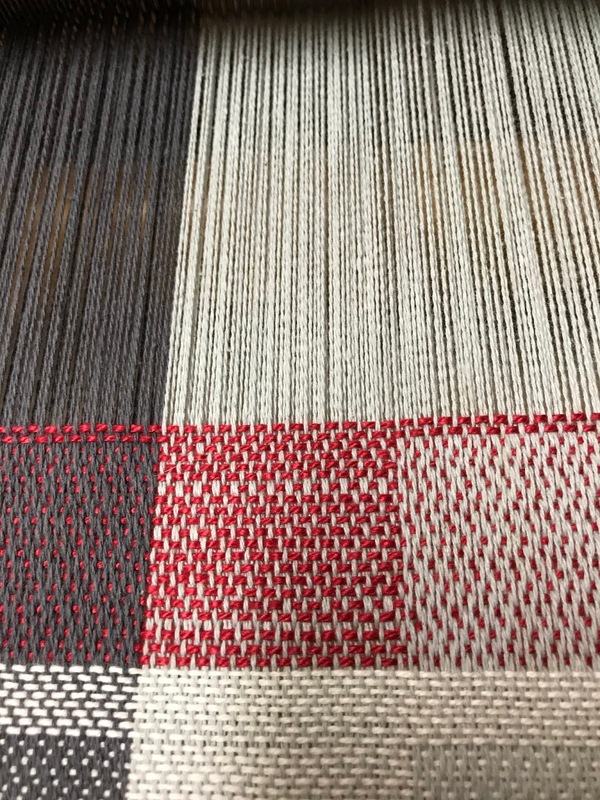 It has been a dream of mine to learn weaving, ever since I was a child. My opportunity came early in 2005, when my sister-in-law let me borrow her countermarche loom. 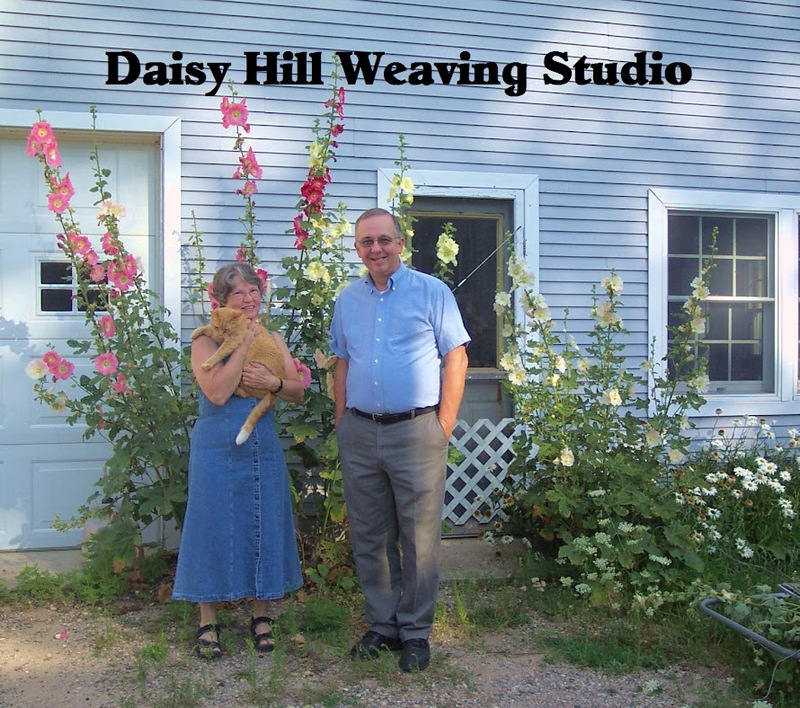 I had a couple friends help me understand the loom and get me started. Those first couple projects were exciting for me. 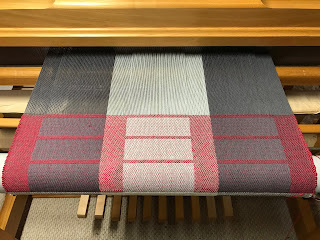 I realized there was a lot to learn, so I signed up for Weaver's Boot Camp at Heritage Spinning and Weaving, in Lake Orion, Michigan. 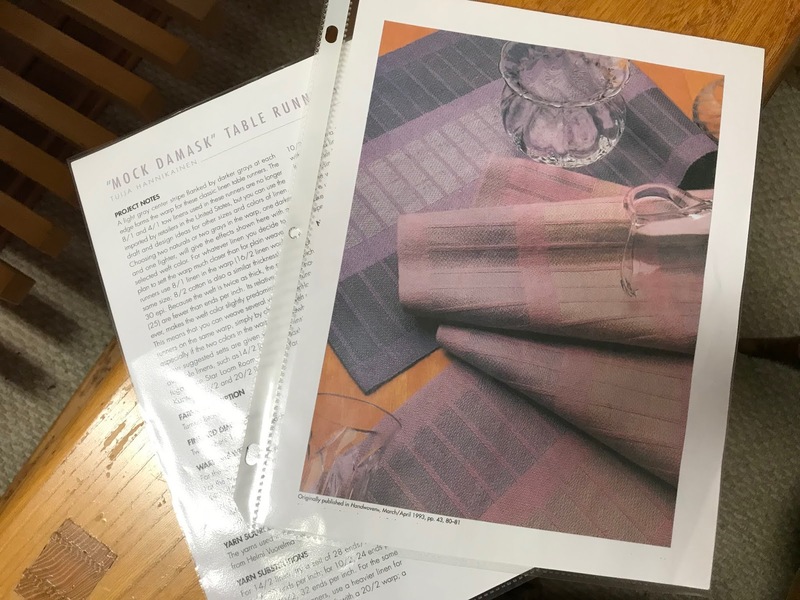 The class was great, I met a wonderful circle of weaving friends, and it pushed me into areas that would have taken me years to explore if I had been learning on my own. Should Towels Be Hemmed Before or After Washing?